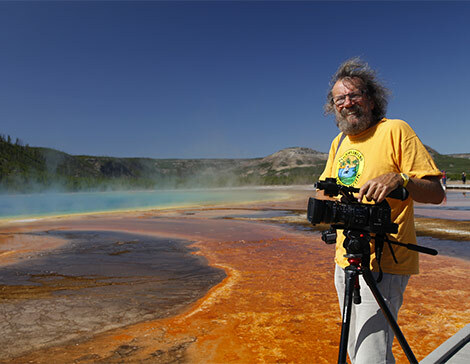 The Western end of Wyoming boasts a true wonder of Nature, Yellowstone National Park As soon as we enter its eastern gate, we catch a glimpse of the most numerous occupants of Yellowstone : the famous bison here they are far from becoming extinct, despite the large numbers of visitors who come to admire the many geysers in the park. 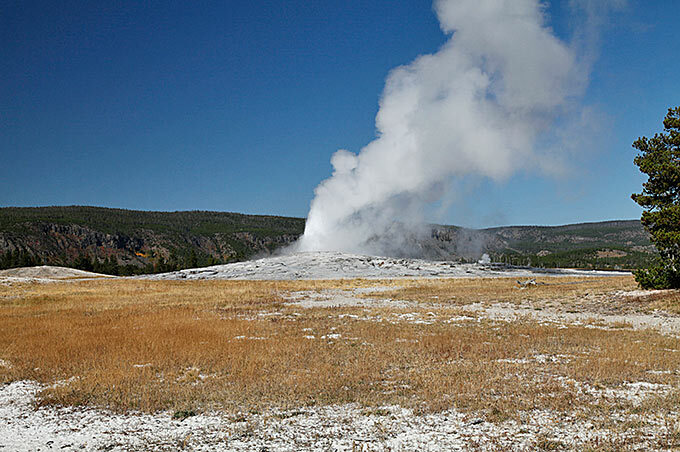 One of them spits at fairly regular intervals of one to two hours, hence its name, Old Faithful. 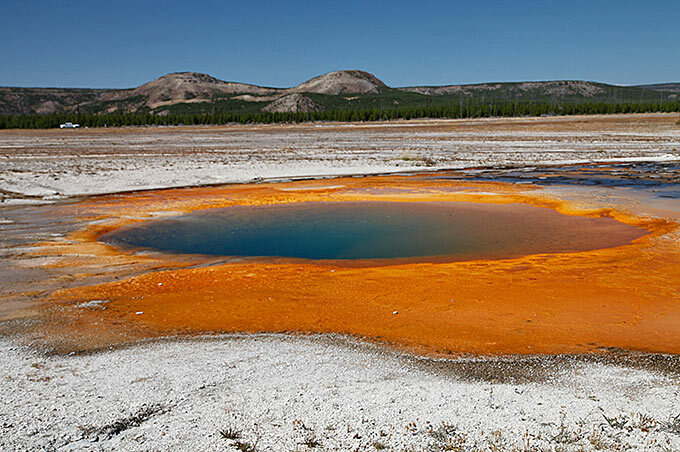 It is surrounded by hot springs that show amazing colours, as striking as those given to water streams by various microorganisms. 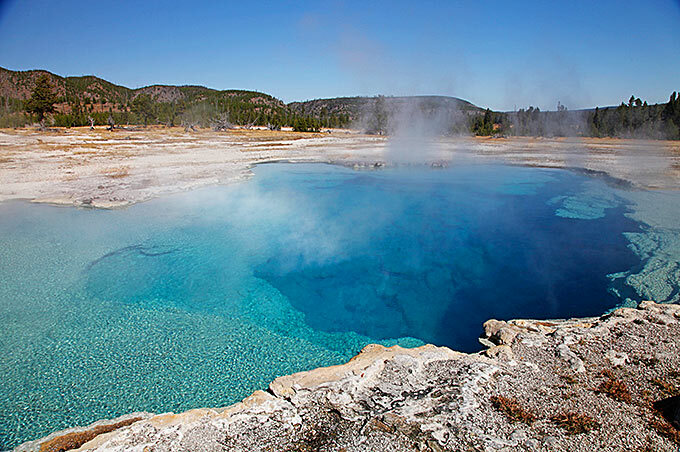 A path leads to some unfrequented wonders again, such as the Gem Pool, or the superb ensemble called Artemisia, which also includes a Geyser. 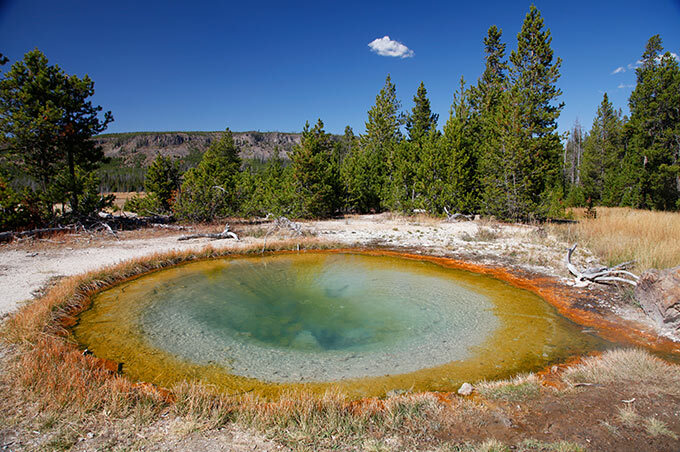 For me the most spectacular of all these hot springs is the extraordinary Morning Glory. 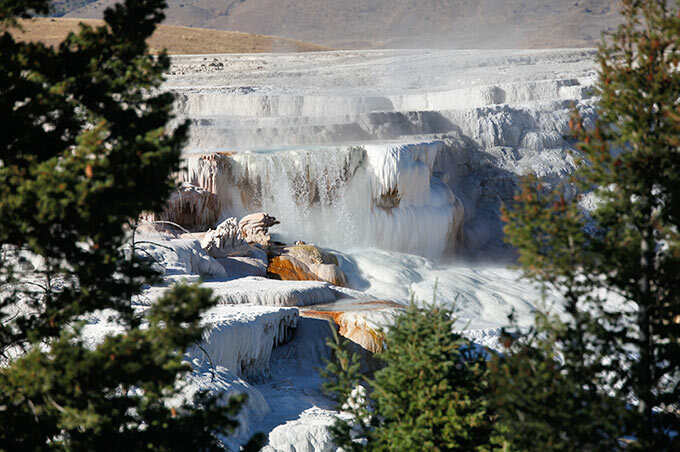 Other geysers are biding their time, like the Giant Geyser, whose eruptions are unpredictable: it can spit out up to 75 meters high. 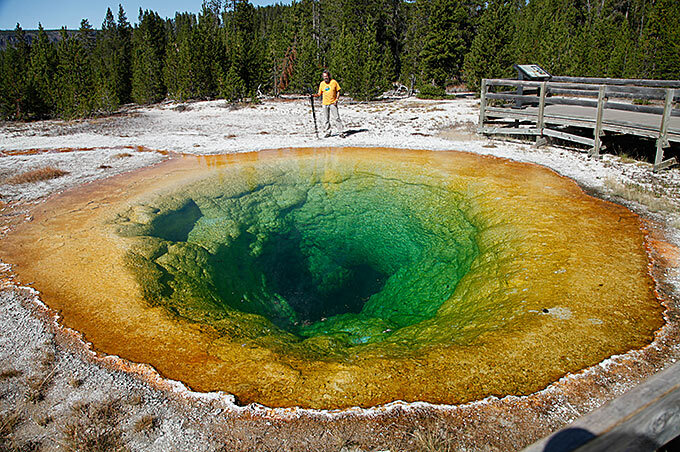 Beautiful too are Chromatic Pool, and Beauty Pool, that reflect the pines of Yellowstone. 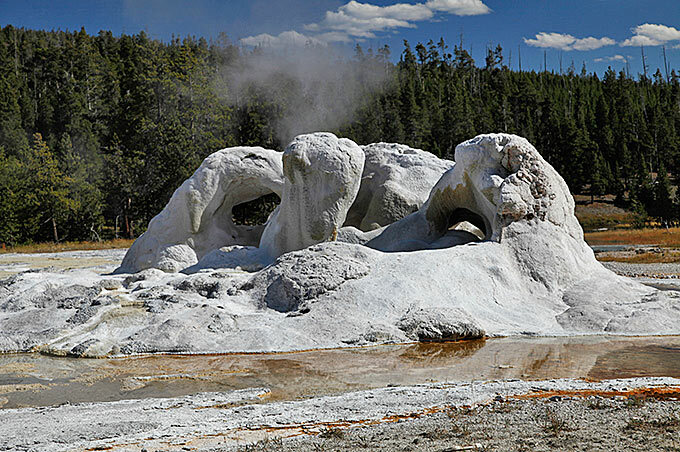 A little further on, Norris Geyser Basin is composed of fascinating terraces under which water temperatures rise above three hundred degrees Celsius. 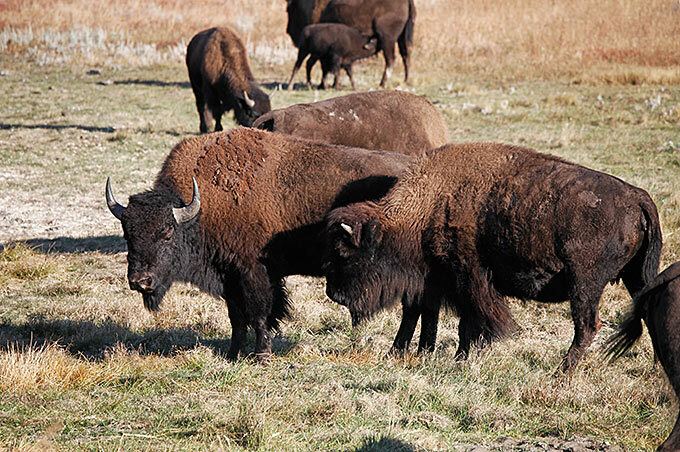 The most picturesque means of transport to visit Yellowstone are the yellow buses that will take you on excursions, making frequent stops to admire wildlife, especially bison, numerous on the banks of the river, in Hayden Valley. 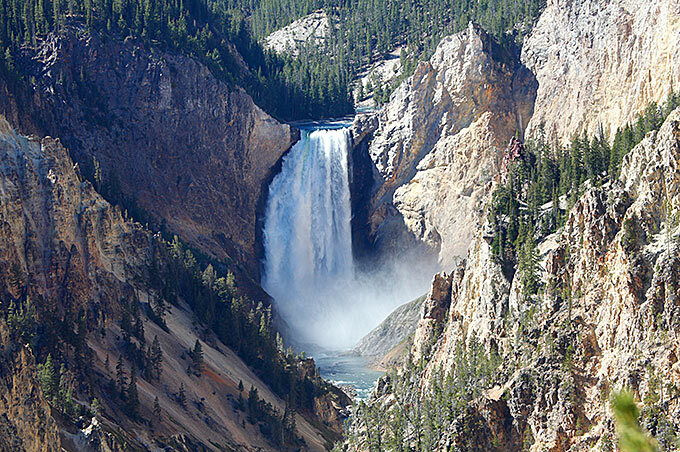 Finally, we head towards one of the most impressive areas in Yellowstone. 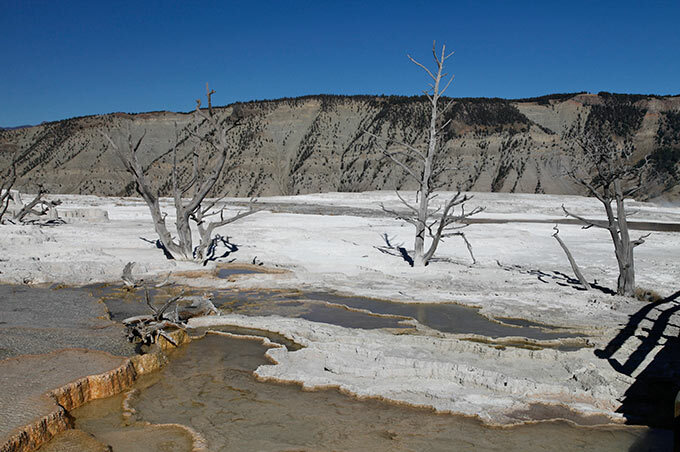 A fault in the Earth's crust lead the boiling waters of Norris Basin to a place where they create one of the most spectacular geothermal phenomena I've ever seen. 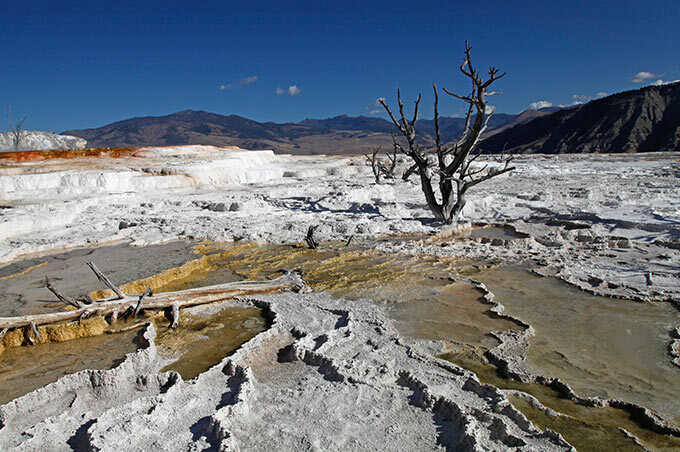 Canary yellow, beige, brown, white, the upper terraces are remarkable; In these hot waters live curious organisms that give the sources their colors, and that take surprising forms ; They are called thermophiles, because they can withstand temperatures close ton the boiling point. 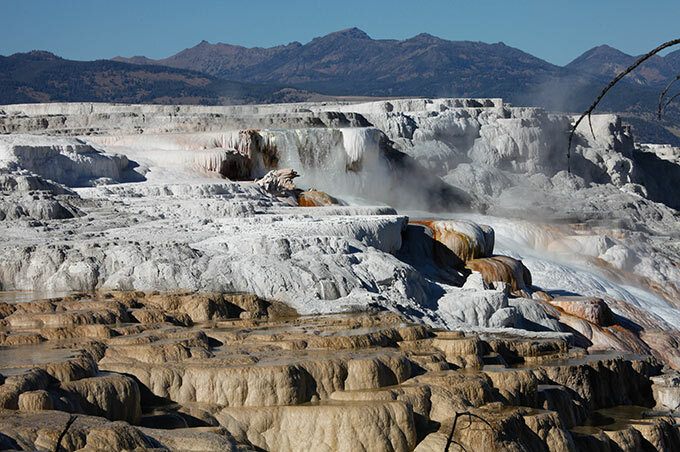 The sight is even more beautiful when one takes in the slope where travertine has been deposited in an immaculate substance from which numerous hot springs flow. Calcium carbonate is sometimes deposited in long filaments, looking like lace. Finally passing the painter's palette, one reaches the bottom of the hill, where one can admire in all their glory these multicolored terraces, in sparkling hues, precisely resembling the fountains that were built in Rome, at the Tiburtina ... besides, the name of this rock, travertine, precisely comes from the italian word Tiburtina... and some of these terraces seem to come straight from a piazza in the Eternal City !